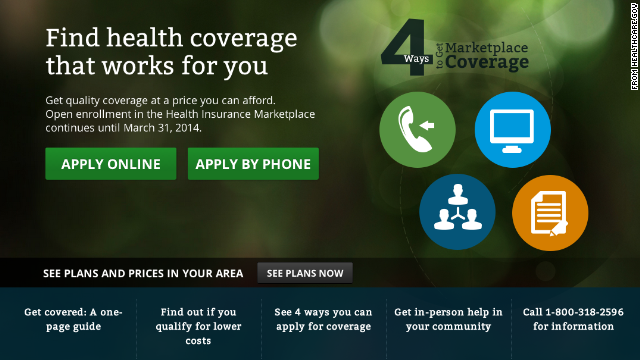 (CNN) – A newly disclosed report indicates that officials in the Obama administration and the Department of Health and Human Services received warnings from a private consultant group that the federal online healthcare enrollment site could potentially fail to function properly for the October 1 launch date. The analysis by McKinsey & Company was requested by the White House. It identified various problems with the exchange, including limited testing time and resources before the launch, and found that call-in centers wouldn't function properly if the website malfunctioned. The Obama administration has come under fire for the botched October 1 launch of healthcare.gov. The site has been plagued with technical issues barring many enrollees from signing up for the federal exchange though the site. This report suggests problems were brought to the attention of key officials as early as March. The administration has said the President didn't know of problems with the Affordable Care Act's website until after its fumbled rollout - even though insurance companies had been complaining and the site crashed during a pre-launch test run. CNN received the report from the House Energy and Commerce Committee. The committee said Health and Human Services Secretary Kathleen Sebelius received a briefing at the HHS headquarters with these concerns on April 4, along with acting administrator of the Centers for Medicare and Medicaid Services Marilyn Tavenner and White House chief technology officer Todd Park. Park was also present at a briefing on March 28 at the CMS headquarters in Baltimore, Maryland. “Despite assurances from Secretary Sebelius, Marilyn Tavenner, and Gary Cohen that ‘all was well’ and ‘on track’ with the launch of the Affordable Care Act, we now have documents dating back to April that call into question what they told us,” said Subcommittee on Oversight and Investigations Chairman Tim Murphy (R-Pennsylvania). On Tuesday, a House Oversight and Investigations Subcommittee holds a hearing on the security of the federal healthcare website. McKinsey's report says the group reviewed 200 documents and sources, interviewed about 40 people across a variety of federal agencies and participated in some meetings and work sessions. But the analysis did not include outside interviews with insurers or access computer code or programs. The report also points to potential areas of risk that never became a significant issue - like the data hubs used by the state sites and the federal site, to verify applicants' income, citizenship and eligibility. Or prolonged call times, which have been brought down in the weeks following the launch. The story was first reported by the Washington Post. CNN Senior Congressional Producer Deirdre Walsh contributed to this report. That's the problem with the IT field these days. Too many consultants and not enough staff actually working on the projects. Good thing they paid McKinsey tax payer money to state the obvious outcomes, then proceed to not do anything about it. Go government! NEWS ALERT : The official, Henry Chao, visibly stunned Rep. Cory Gardner (R-Colo.) when he said under questioning that a significant fraction of that online insurance marketplace has yet to be constructed. "We still need to build the payments system to make the payments [to insurance companies] in January," Chao said during testimony. That so-called financial management tool was originally supposed to be part of HealthCare.gov when it launched Oct. 1, but officials later suspended its launch as part of their effort to get the consumer interface part of the site ready. Chao on Tuesday said other areas that need to be built include "the back-office systems, the accounting systems." Overall, Chao said, about 30 percent to 40 percent of the federal Obamacare marketplace has yet to be developed." Is it too much too ask that the Obama Administration be even slightly competent? Once again, the real story about the Affordable Care Act roll out is not being covered by CNN. It is now known that Tea Party financial supporters, the Koch Brothers, funneled a small fortune through non profit organizations which have been systematically sabotaging Obamacare. That IS news and CNN is ignoring it and, instead, rehashing Tea Party Talking Points and focusing on the rocky roll out of healthcare.gov. I do not think CNN deserves a pass on this one. The implications are obvious. More and more and more lies from Obama and his liberals! Why does anyone support them anymore?!?!? These are the same ole repubs saying the same ole thing. Nothing has changed, if you don't like the president, oh well. No one is listening to your false outrage. This has been the same diatribe that the people who did not vote for Obama in the first place has been saying. That is why they are so unconvincing. I am so glad the tax payer is paying for this mess!! I personally think that ALL of the Democrats need to pay for this they had to hurry and pass it into law. FYI I am not a Republican or Democrat both make me sick!!!! Well said, 100% the TRUTH!!! I consider myself to be fair and objective, but this has not been simply a disastrous rollout but a disastrous idea. To think anyone can stipulate terms to insurance companies is crazy. They are the worst of the worst, how did we get two village idiots in a row rom Harvard??? So they knew? I'm not sure if I'm going to vote in the midterm elections. Liars on the left, liars on the right. Hey, the ACA computer system works just as well as our Congress. Did you expect anything different? It's their law and their bill. So what People don't listen to warnings. It is very interesting to read articles about the Affordable Care Act, however it seems that every article has either a slight opinion about it, or a vengeful storm of flagrant abuse. Where do I go to find solid, unbiased information about what is actually happening? I cannot help but wonder if the author of the article is holding back some small fleck of information that would change the matter entirely for me. I also cannot help but wonder if the author knows something, but does not want to reveal because of personal convictions, or a desire to sway public opinion. I send my deepest respect to these diligent reporters, but they must recognize the massive power they hold as voices of the media, and understand that they can institute their own voices through their articles. What I am simply trying to insinuate is this; can we really trust the people who give us our information? Can we trust them to limit themselves to solid facts? I simply want the unbiased facts about what is currently occurring without worrying about the validity of the information. Aside from that, it is wonderful to see so many involved and passionate comments about this subject. No one is really passionate about the Affordable Care Act where I am from.